73 Marlborough is located on the north side of Marlborough, between Berkeley and Clarendon, with 71 Marlborough to the east and 75 Marlborough to the west. 73 Marlborough was built ca. 1864 for shipping merchant and real estate investor John Lowell Gardner, one of nine contiguous houses (71-73-75-77-79-81-83-85-87 Marlborough) he had built as rental property. He and his wife, Catharine Elizabeth (Peabody) Gardner, lived at 7 Beacon and then at 182 Beacon. Click here for an index to the deeds for 73 Marlborough. By 1864, 73 Marlborough was the home of Susan (Stickney) Lombard, widow of East India shipping merchant Israel Lombard, who had died in May of 1862. Prior to his death, they had lived in Newton. She continued to live at 73 Marlborough in 1868, but by 1869, she had moved to 80 Marlborough, where she was living at the time of her death in November of 1869. By 1869, 73 Marlborough was the home of wool merchant Henry Clay Weston and his wife, Evelyn (Owen) Weston. They previously had lived at 4 Pemberton Square. By 1872, they had moved to a new home they had built at 177 Beacon. By 1875, 73 Marlborough was the home of professor William Watson and his wife, Margaret (Fiske) Watson. They had married in August of 1873, and 73 Marlborough may have been their first home together. William Watson had been an instructor of mathematics at Harvard from the time of his graduation in 1857 until 1860, when he traveled to Europe to continue his studies. While in Europe, he gathered information on the European polytechnic university model which subsequently formed the basis on which the Massachusetts Institute of Technology was organized. From 1865 through 1873, he was a professor of mechanical engineering and descriptive geometry at MIT. He later became Secretary of the American Academy of Arts and Sciences. 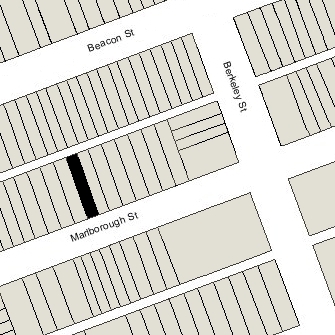 William and Margaret Watson continued to live at 73 Marlborough in 1877, but had moved to 107 Marlborough by 1878. 73 Marlborough was not listed in the 1878 and 1879 Blue Books. By the 1879-1880 winter season, 73 Marlborough was the home of Abbott Lawrence Lowell and his wife, Anna Parker (Lowell) Lowell. They had married in June of 1879, and 73 Marlborough probably was their first home together. 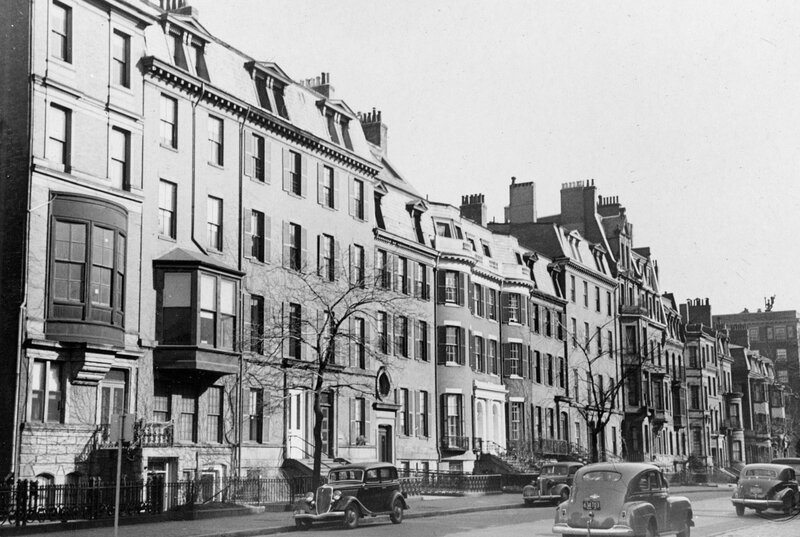 Prior to their marriage, he had lived in Brookline with his parents, Augustus Lowell and Katherine Bigelow (Lawrence) Lowell, and she had lived at 151 Beacon with her parents, George Gardner Lowell and Mary Ellen (Parker) Lowell. A. Lawrence Lowell was an attorney and later would become President of Harvard. The Lowells continued to live at 73 Marlborough during the 1890-1891 winter season, but moved soon thereafter to 171 Marlborough. By the 1891-1892 winter season, 73 Marlborough was the home of banker Charles Lowell and his wife, Beatrice Kate (Hardcastle) Lowell. Beatrice Lowell was English and they had lived abroad, in India and England, from the time of their marriage in November of 1885 until 1891. 73 Marlborough probably was their first home in Boston. They continued to live there during the 1895-1896 winter season. By the next season, they had moved to 149 Beacon. 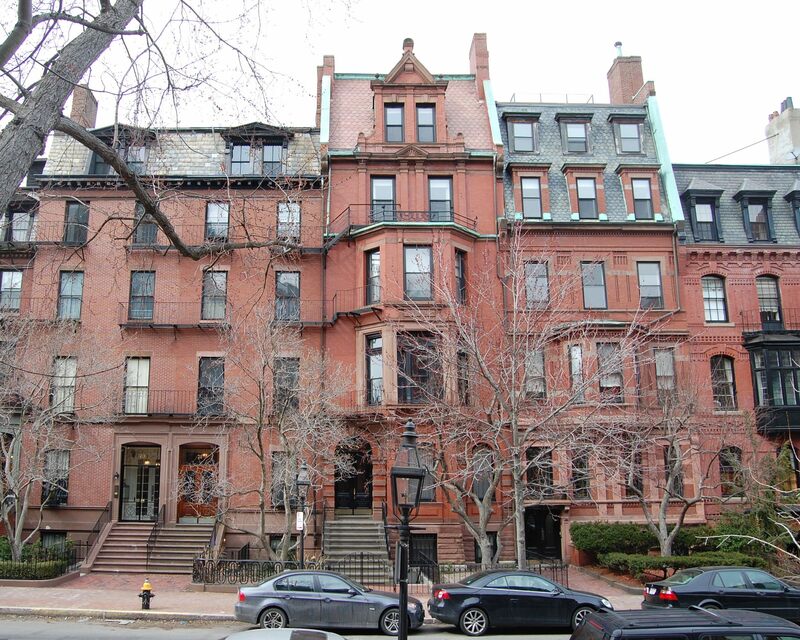 73 Marlborough was not listed in the 1897 Blue Book. By the 1897-1898 winter season, it was the home of Rebekah (Whittaker) Briggs, widow of Dr. Charles Edward Briggs. Her husband had died in June of 1894; he had been a physician and professor of medicine in St. Louis. Their daughter, Caroline (Briggs) Codman, the widow of John Codman, II (who had died in August of 1897), and their daughters, Rosamond and Ruth Codman, lived with her. On December 21, 1899, the trustees under John L. Gardner’s will transferred 71-73 Marlborough to his grandson, Francis Skinner, Jr.. 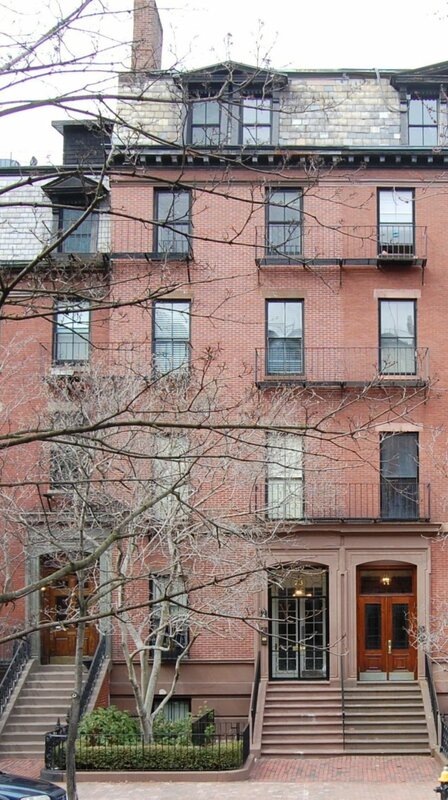 He lived at 266 Beacon with his widowed father, dry goods merchant Francis Skinner. He married in June of 1900 to Sarah E. Carr; after their marriage, they lived in Dedham. Rebekah Briggs, and probably her daughter and granddaughters, continued to live at 73 Marlborough during the 1900-1901 winter season, but moved thereafter. By 1910, they were living in Dedham. By the 1901-1902 winter season, 73 Marlborough was the home and medical office of Dr. Francis Joseph Keany, a dermatologist. Dr. F. X. Crawford lived and maintained his medical office with Dr. Keany. Francis Keany married in February of 1902 to Ellen A. Mahoney and, after their marriage, they lived at 73 Marlborough. Dr. Crawford moved his residence but continued to maintain his office there with Dr. Keany until about 1911. On March 30, 1907, Dr. Keany purchased 73 Marlborough from Francis Skinner, Jr.
Francis Keany died in November of 1916. Ellen Keany and their three teenage children – Frances, Matthew, and Katharine — continued to live at 73 Marlborough during the 1917-1918 winter season, but moved thereafter. By 1920, they were living in Andover. On June 18, 1919, 73 Marlborough was purchased from Ellen Keany by Carrie Louise (Munn) Boardman, the wife of real estate dealer Reginald Boardman. They had lived at 128 Beacon during the previous season. They also maintained a home, Chubbs, in West Manchester. They continued to live at 73 Marlborough until shortly before their divorce in August of 1932. Thereafter, he moved to an apartment at 65 Commonwealth (where he was living by late 1932). Carrie Boardman remarried in September of 1932 to Lawrence Waterbury, a noted polo player. 73 Marlborough was not listed in the 1933-1937 Blue Books and was shown as vacant in the 1933-1936 City Directories. On May 29, 1936, 73 Marlborough was acquired from Carrie Louise (Munn) Boardman Waterbury by real estate dealer Henry C. Brookings. On June 10, 1936, it was acquired from him by Evelyn Clark (Alden) Pike, the wife of attorney Horatio Alden. They lived in Brookline. On January 21, 1937, 73 Marlborough was acquired from Evelyn Alden by Margaret (Curtis) Bohlen Pike, the wife of Evelyn Alden’s brother, Carleton Maxwell Pike. They also maintained a home in Lubec, Maine. They had married in July of 1934. Margaret Pike had been married previously, to realtor Henry Morgan Bohlen, from whom she was divorced in about 1933. Prior to their divorce, they had lived at 311 Marlborough. Carleton Pike had served in the American Ambulance Service in World War I. After a career in business, he retired and in the late 1930s served as treasurer of Woodward School at 319 Marlborough. During World War II, he served as a naval officer. The Pikes continued to live at 73 Marlborough until about 1947. On September 18, 1947, 73 Marlborough was acquired from Margaret Pike by Julia Pierrepont (Edwards) Johnson, the widow of attorney Reginald Mansfield Johnson. She continued to live there until her death in June of 1954. On December 16, 1954, 73 Marlborough was purchased from Julia Johnson’s estate by Edward M. Walsh and his wife, Octavia Morley (Sawyer) Walsh. They previously had lived at 304 Beacon. 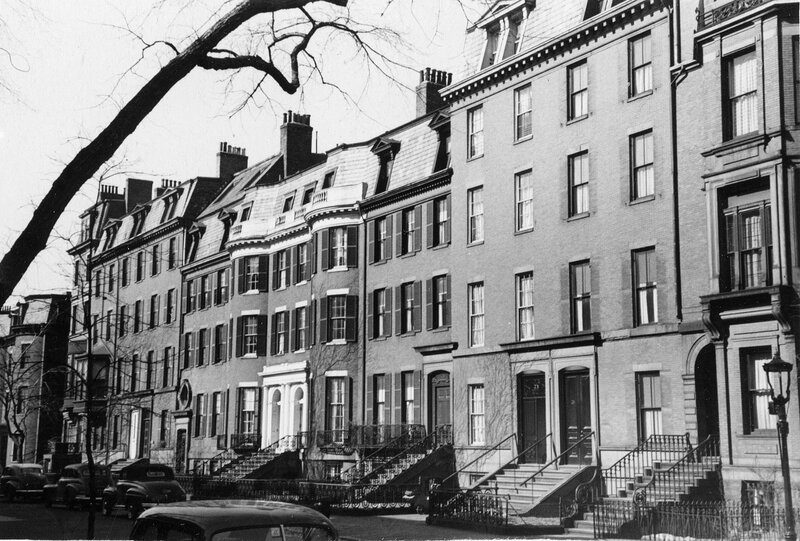 In December of 1955, he applied for (and subsequently received) permission to convert 73 Marlborough from a single-family dwelling to a lodging house. In February of 1956, the Walshes purchased and subsequently moved to 75 Marlborough, which they converted to a lodging house. On February 15, 1956, 73 Marlborough was acquired from Edward and Octavia Walsh by real estate and furniture dealer Jack Fay (Jacob Fagelman). He and his wife, Nellie (Goldman) Fay, lived in Brighton. He continued to operate 73 Marlborough as a lodging house. On June 3, 1982, 73 Marlborough was purchased from Jack Fay by Sam Y. Kim. 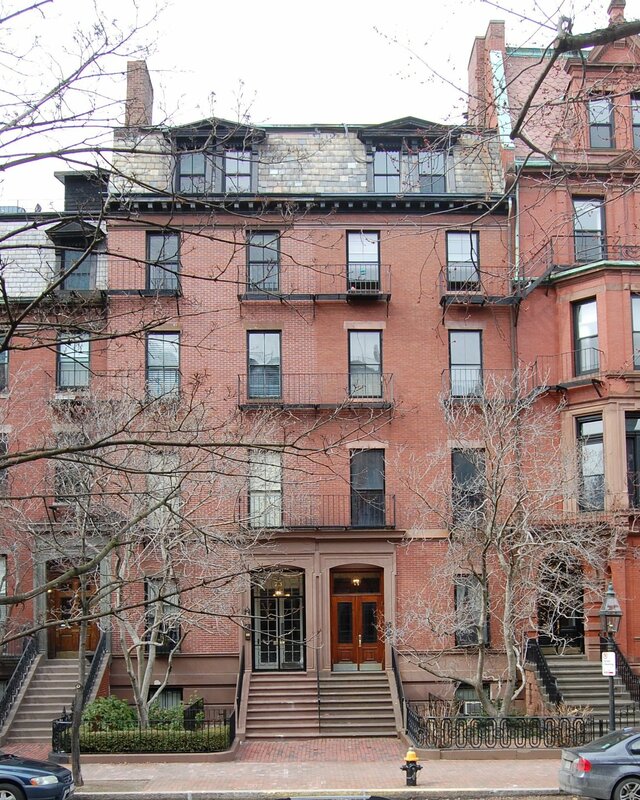 On April 15, 1983, Sam Y. Kim converted the house into five condominium units, the 73 Marlboro Street Condominium.